The Radox Edwardian Traditional Towel Rail introduces a touch of 'Upper Class'. This radiator brings the traditional look to your bathroom with a wall or floor mounted ball jointed towel rails. This simple design is a delightful option to add in your room. The Radox Edwardian ﻿is made out of mild steel. The Reina Serpe Designer Towel Rail has a stunning design, it has modern square bars that flow and create a serpent like effect. Very beautiful and striking. And with great space to hang those towels to keep them warm and toasty. The Serpe would look fantastic in any bathroom, or kitchen to hang tea towels on! The Reina Serpe is available in Polished Chrome. 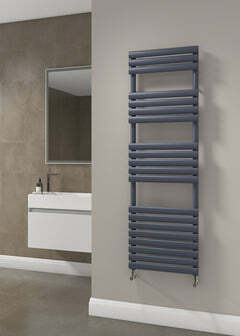 The Reina Square Designer Towel Radiator is a stunningly simple design - but with a lot of character. The Square would look great in kitchens or cloakrooms due to its space-saving design. The Reina Square is crafted out of stunning stainless steel. The DQ Fender Towel Radiator is a stunning sleek, modern funky designer radiator. This is a versatile and practical radiator as you can add shelves to store towel or toiletries which is great feature. The DQ Fender would make a fantastic addition to any bathroom or kitchen. It is the big brother to the DQ Oakham which is designed for smaller spaces. 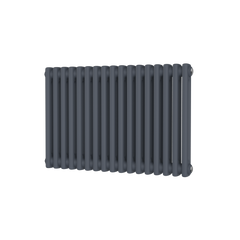 The DQ Fender Towel Radiator is available in mild steel and is available in Central Heating, Electric or Dual Fuel. If you are interested in the Dual Fuel option please contact us for the price. Available in either Matt Black as standard, or a great choice of RAL Colours. To choose a RAL colour please view the chart in the images on the left, then select RAL from the dropdown and add to cart. When you get to the checkout please enter your choice in the notes section. If you require assistance please contact us. 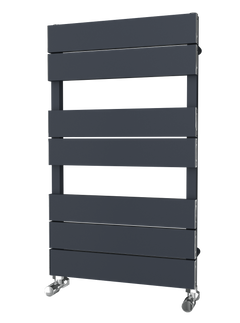 The Radiator Company BDO Athena Towel Radiator has a beautiful design, with a luxurious looking flat bar front based on an svelte slimline chassis. To choose the RAL colour you require, please select the colour on the right and then type in your choice to the notes box at the checkout - to view available colours please click here, we will then confirm back by return. The Radiator Company BDO Step Towel Radiator is a creative take on the normal towel rails. It has curved flat bars to give great space for hanging those towels. The BDO Step is a beautiful design and would look great in any bathroom, or even a kitchen for hanging tea towels on! This great design was also a Reddot Awards Design Winner and is made in Italy. The Radiator Company BDO Step Towel Radiator is available as either White Pearl, Chrome or Black Chrome. Delivery: Made to order in 5 weeks. Brand New Product for 2018! The Reina Polia Designer Towel Radiator is a brilliant design, creating a beautiful centre piece for your wall. It has a nice and large opening to hold even the thickest of towels. The Polia has lovely space-saving qualities. It would therefore work brilliantly in any bathroom, or even cloakroom. The Reina Polia is available in White or Anthracite. The Radiator Company BDO Poll Towel Radiator is a lovely horizontal towel rail. It has rounded bars ensuring plenty of space for warming those towels. The BDO Poll is great design, and would look brilliant in your bathroom. The Radiator Company BDO Poll Radiator is available as either White, Chrome, RAL colours or Special finishes. If you require a RAL colour please put your choice on the notes section at the checkout, or give us a call and we can add in. The Radiator Company Poppy Towel Radiator is a clean crisp design. It has a great choice of colours and sizes. So would make an ideal choice. The RDC Poppy is great design, and would look brilliant in your bathroom. The Radiator Company Poppy Towel Radiator is available in Chrome, White or 25 RAL Colours. The Carisa Ajax Towel Radiator is a great little design, with simplicity at its heart. It is elegant and unobtrusive. The Carisa Ajax is a small space marvel, that would be equally at home in a larger environment. The Ajax I comes with 1 bar, and the Ajax II comes with 2 bar. The Ajax is made out of Aluminium it heats up and cools down quickly with lower energy costs as a result. The Reina Deno Stainless Steel Towel Radiator has chunky rails and good spacing for keeping towels and clothes nice and warm. The Deno would look great in any kitchen or bathroom. The Reina Deno is crafted from stunning stainless steel and available with either a polished or brushed finish. The Carisa Frame Towel Radiator has a really distinctive design, with a beautiful frame around the radiator bars. The Carisa Frame is a stand out towel radiator that really will wow your visitors. The Frame is made out of MIld Steel and is available in Polished Chrome. The Reina Luna Stainless Steel Towel Radiator is a simple and elegant design, it would enhance any bathroom or kitchen. The Luna is made out of quality stainless steel and for complete peace of mind comes with a 25 year manufacturer guarantee. Available in central heating, electric, or dual fuel this has fantastic fitment options. For central heating, all you need to do it connect it to your existing or new boiler system via a Valve. For electric you would need a electric heating element and then connect to a fused spur, and for Dual Fuel you would need to connect it to the system via a valve, a electric element and a t piece connector. The Reina Arden Designer Towel Radiator is wonderfully designed with square bars coming off flat uprights. The Arden would look great in any bathroom or cloakroom. The Reina Arden is made out of stunning stainless steel. The Reina Eos Designer Towel Radiator is a elegant curved design, made out of stunning stainless steel. The Eos would look great in any bathroom or kitchen. The Reina Lago Designer Towel Radiator has a lovely square design. It comes with either 1 bar (Lago 1) or 2 bars (Lago 2). The Reina Lago and enhance any bathroom or kitchen. The Lago is a little space-saving beauty in polished Chrome. The Reina Serena Designer Towel Radiator is a simple ladder design with flat edged bars, to keep towels and clothes nice and warm. The Serena is finished in polished chrome. The DQ Siena Towel Radiator is a simple, elegant design with a modern look. 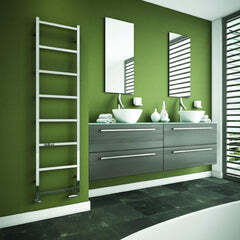 A really versatile towel radiator in a high quality polished stainless steel. The DQ Siena is available is six widths and four heights, giving you plenty of options. The electric option comes with a standard element that is fitted to the right hand side of the radiator. The dual fuel option comes with a Tee piece and standard electric element. Angled valves will need to be purchased separately. The SBH Baby Flat Towel Radiator is an elegant and simple ladder rail. The smallest of the SBH flat range, this radiator is made from stainless steel with a contemporary look. The SBH Baby is a real quality rail and would look stunning in any bathroom. The Reina Camden Traditional Towel Radiator is a lovely column traditional radiator. The Camden would look great in a modern or more traditional setting. With it's high heat output and set within a chrome plated finish this will enhance the traditional look of any bathroom or cloakroom.